After a good amount of research and a good amount of photo collecting i have gotten enough information and pictures to give everyone a good idea of the history of this very unique interior. I will start this post off with information about the seats as well as a picture example of each interior (there is only one that i have not been able to locate). 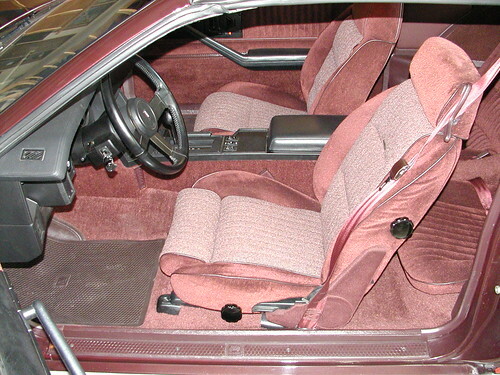 Contrary to belief, Lear Siegler Conteur interiors(referred to as LS/C from now on) was available from 1982-1986 in the Camaro. 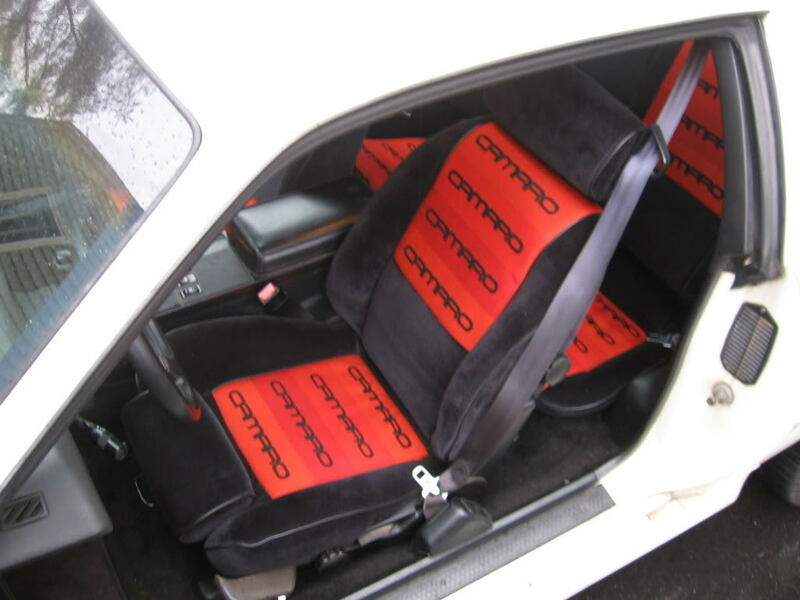 LSC seats are sometimes mistaken for RECAROS because of the bold colors and wording written down the seats looking very similar to the RECARO seating that had come out right around the same time.The drivers seat of this interior had adjustable lower and upper bolsters as well as an adjustable leg rest and head rest (in 83-5 the headrest on the drivers side read "conteur" where in 86 it read "Camaro"). Combined with a power seat track, the driver would have 18 different adjustments! 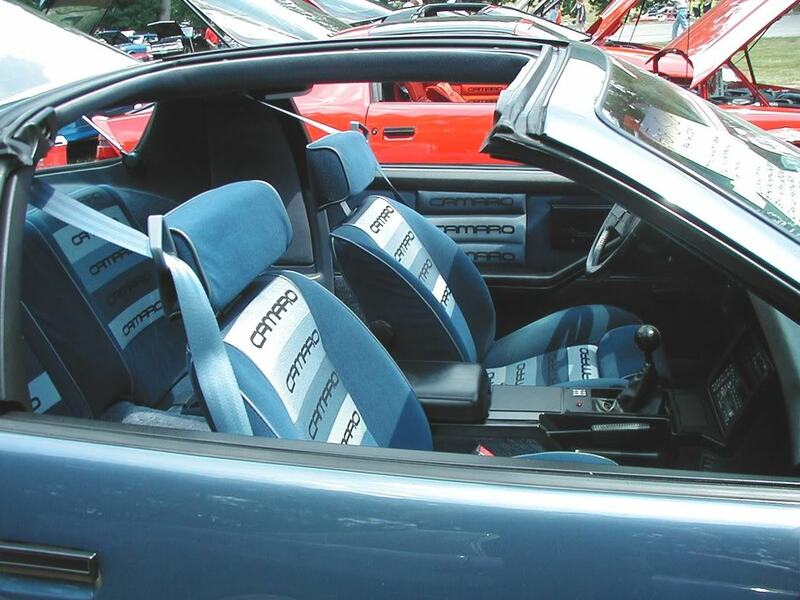 The LS/C seat was only used on the drivers side in the Camaros and both drivers and passenger seat in the trans am. It was only available on z28s or irocs(1985). In 1986 however it has been proven that they were installed in lesser models. This article will cover only the Camaro conteur interiors however. If someone else has good information about the trans am interiors i would be interested in hearing from you. 1982. 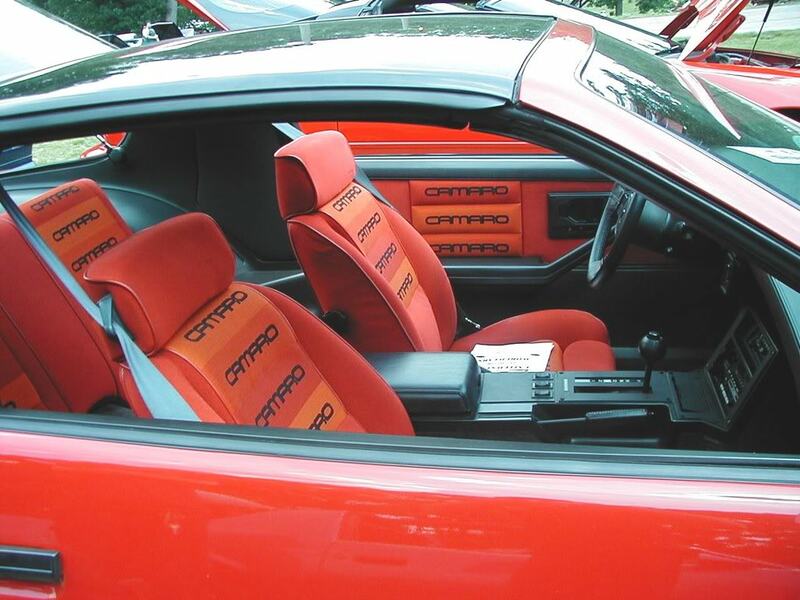 This was the first year of the third gen Camaro/Firebird and also the first year of the LS/C interior. It was not the "in your face" bold fabric of the 83-85 interiors that everyone is accustomed to. The only call out on the seat was a small badge in the center of the back that read "conteur". It was available in three colors: Camel (64D), Charcoal (18D), and Maroon (no code). 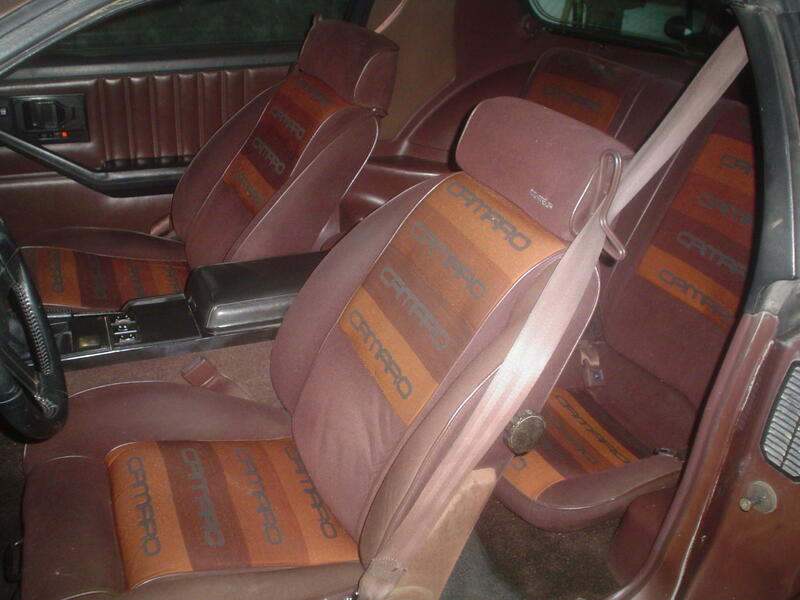 These were the "normal" conteur interiors for 82 with movable headrests for the driver but fixed headrests for the passenger. 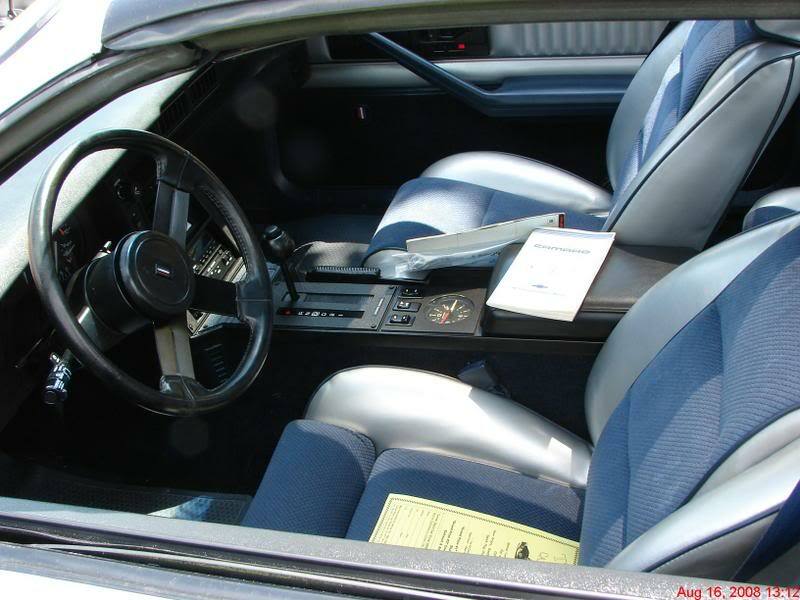 There was also the 82 Indy 500 pace car replicas that got the conteur interior in blue/silver. 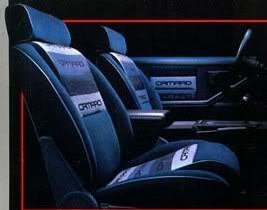 This design would be the predictor of what was to come for 83 with movable headrests for both driver and passenger. 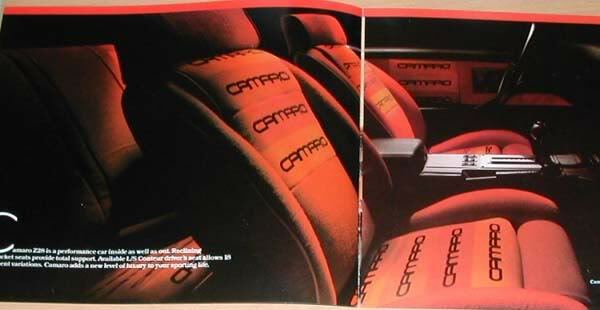 The seats were shaped more like t he 83/84 conteur seats as well. 1984. Second year of the spectrum cloth. This was a repeat year of 1983. 1985. Last year of the spectrum cloth. They changed it up this year though. It was again available in only three colors but they were all different than the previous two years. Costs when new This interior was anything but cheap. To get it you would have to fork over 650 dollars plus an extra 210-225 (210 for 1983, 215 for 84 and 85, and 225 for 86) for a power drivers seat, totaling the adjustments on the drivers side to 18. SMS Auto Fabrics in Oregon. http://www.smsautofabrics.com The fabric ran $85/yd. For the 84 interior, the SMS part number is "84 #447 Red" This is for the bolster fabric. They may have other colors other than the burnt orange available. http://desertsunauto.com/camaro_information.htm After reading around their website it looks as if they might be reproducing the fabric. If anyone has more information i will come back and update this. 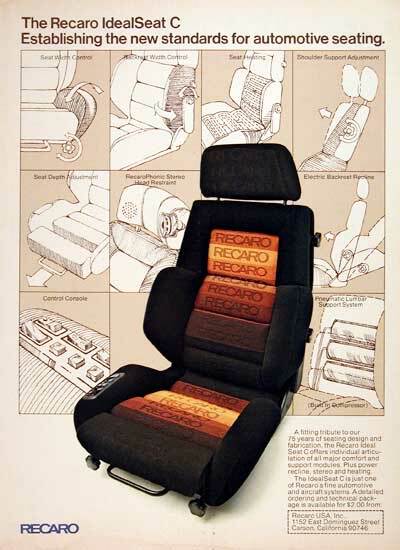 1978 RECARO seat ad. These are what LSC seats are sometimes mistakenly called. They do bear a very similar appearance when upholstered with the spectrum fabric. Last edited by subroc; 04-06-2010 at 07:42 PM. Last edited by subroc; 05-09-2010 at 05:04 PM. I will add a custom conteurs section to this when i get a chance. But this will start stuff off. If anyone has anything to add or any suggestions let me know! Hope you enjoy. I would like to thank John (John in RI), Jame C, and drduster for all their help in this. Last edited by subroc; 06-27-2009 at 10:25 AM. Sticky? 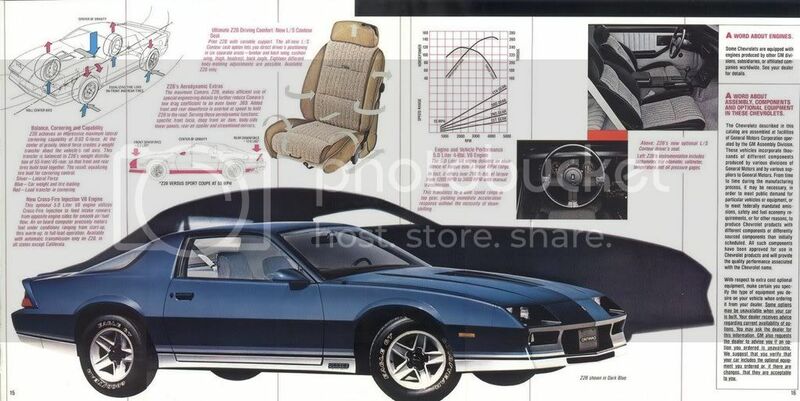 Good work, I recently found a 84 silver metallic Z28 with the burnt orange interior. It was pretty thrashed though unfortunatly, or else it would be my new dd...... Cya! Yea it would be great if i could get this stickied. I had alot of questions about this interior and ended up doing tons of digging and talking to a few board members who knew a thing or two about it. Now most if not all i know about it is above. 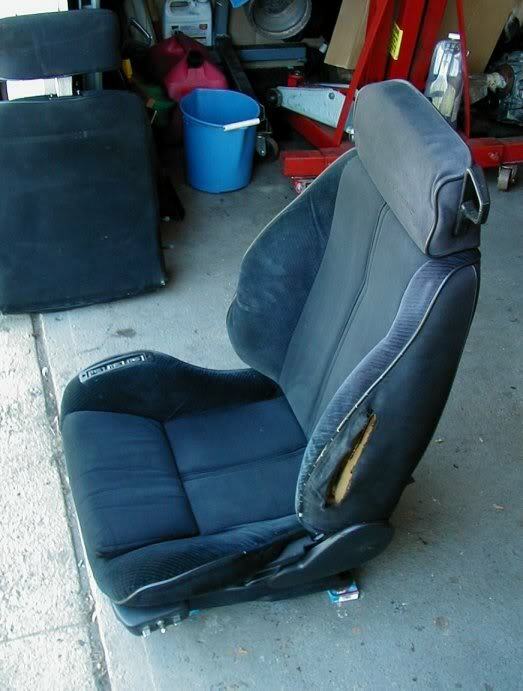 I've seen the CAMARO CAMARO CAMARO spectrum fabric seats in the junkyard. 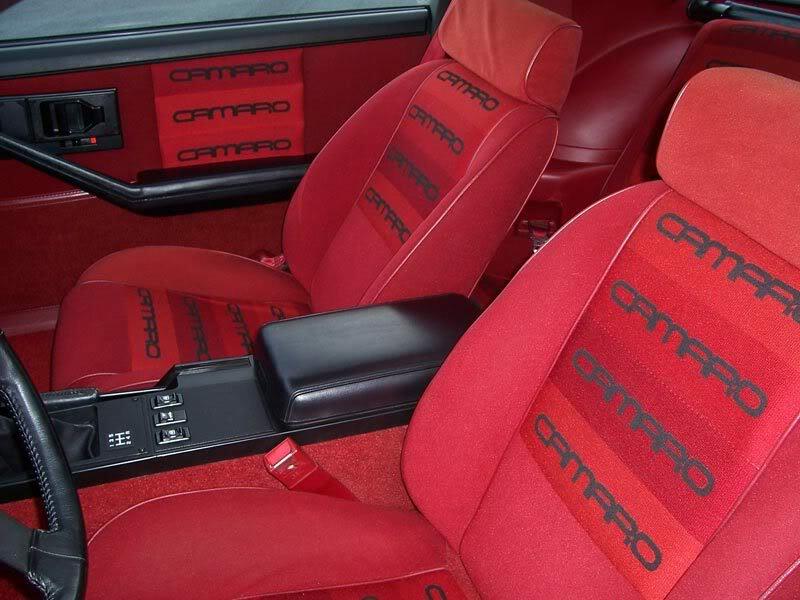 Along with PMD power seats, recaro seats with the stiff net headrests and everything in between. I think I go go junkyards too much. That black 85 looks bitchen!. My old 1982 pace car had the ajustable drivers seat. Did all of the pace cars have this option? There must have been a year where the blue changed. My 84 has the same blue that is pictured in this thread. I'm restoring the conteur cloth and found a bolt of blue cloth that is way darker than the origional blue. The origional 83/84 blue is light, with a hint of silver. The fabric that I have (GM Origional) is a very dark blue with no hint of silver. I'll post a picture up soon. you can buy this cloth from gm? the camaro camaro camaro fabric? 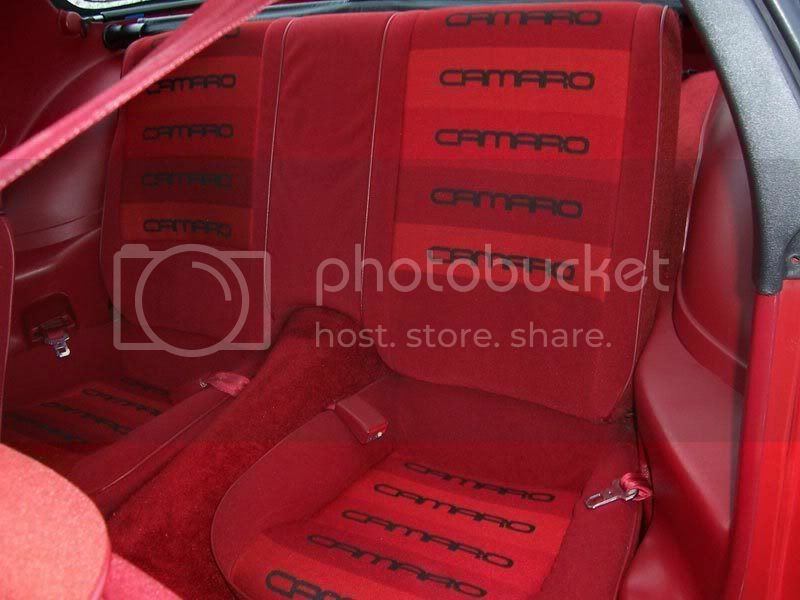 Last year I searched for the Contour "Camaro" cloth to no avail. Had a variety of trim shops try to find it for me and could only locate the solid black material used on the headliner and seat backs and sides. So if anyone knows where to buy this cloth let me know. Black "Camaro" Conteur material is for sale right now on EBAY. I think the sellers name is " Rohnaz". But,I don't need it that bad unless maybe someone wants to go in with me? He's been trying to sell that stuff for the last two years. Maybe you can email him with an offer. I e-mailed him for his "bottom dollar". Will see what happens. Thanks for the heads up on how long he's had it. May help me. John has about two interiors worth of the burnt orange/red fabric as well as the brown 83/84 fabric above. I already bought one interior worth of the red stuff from him. As far as getting it from GM no you can not. Its all gone from them. If you would like it call up Original auto interiors out of michigan. They have a ton of the black/grey camaro fabric left. I will post the link to their sight when i get a chance in the original thread as well as some more conteur related stuff. 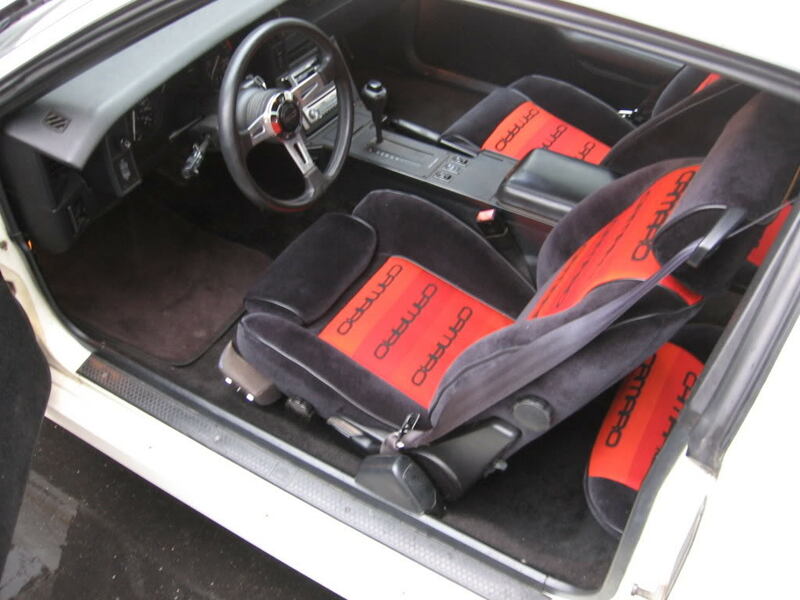 Btw Original auto interiors quoted me a price of 90 bucks for enough grey/black fabric to redo the entire interior. Dont buy from that guy on ebay...way overpriced. BTW thank you to the moderator that stickied this I do have a question though..how do i edit and add more to this post and keep it all together at the beginning (pictures and such in order right after what i have) or should i not bother and just add on another section for the custom conteurs? Last edited by subroc; 02-22-2009 at 01:01 PM. Last edited by Kevin84Z28; 02-21-2009 at 10:01 PM. Here's a picture of the NOS GM spectrum fabric. You can see that it is somewhat darker than the origional. 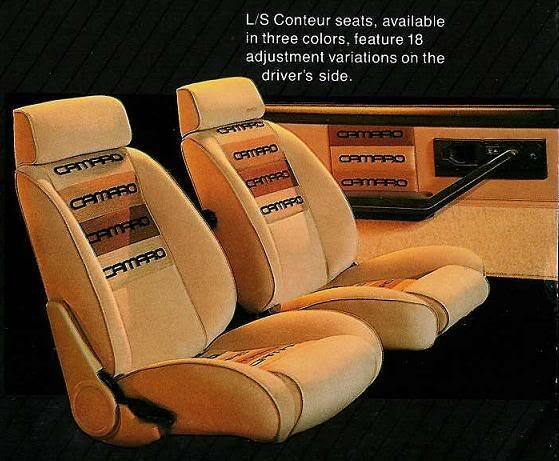 the LS/C seat was only used on the drivers side in the camaros and both drivers and passenger seat in the trans am. Last edited by JamesC; 02-22-2009 at 07:20 AM. 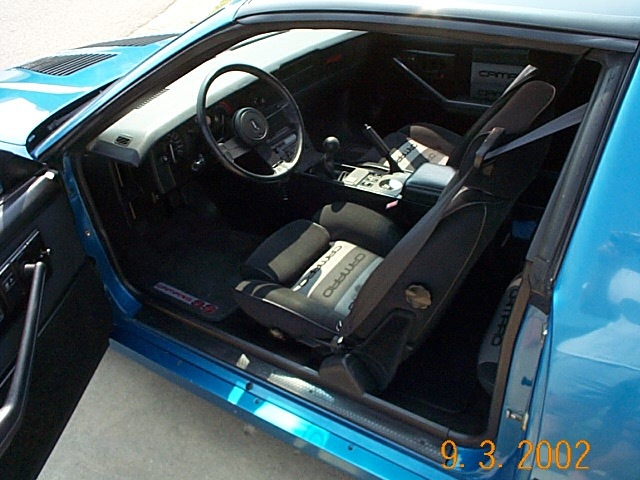 Idk if the passenger seat conteur is any rarer than the camaro conteurs in general...just different (since yours is from a Trans am?). 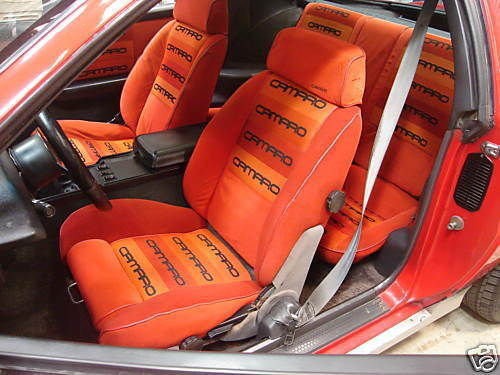 Anyone know if camaros got more of these interiors installed than trans ams? I can see that its noticably darker than the blue fabric shown above, however that could also be due to the 25+ years of use that the other fabric has had. I have the burn orange stuff in my car right now and it is noticably darker than the fabric pictured above as well. I just figured it was due to the sun over the years fading the interiors that i was comparing it to. I think that the replacement NOS fabric just came darker. It's much more darker in person than the picture allows for. Last edited by Kevin84Z28; 02-22-2009 at 08:24 PM. I think your right Kevin. My NOS fabric is not as light as the burnt orange stuff and its def not as dark red as the red interior. I think it was supposed to replace the burnt orange stuff but ended up falling somewhere in between the burnt orange and the red. I decided that i liked the black of the 85 conteur interior and the burnt orange of the earlier interiors so i combined them! I will let others post their own custom conteurs. I know John has one of the nicest custom interiors along with James C.
Last edited by subroc; 02-23-2009 at 09:41 PM. We have this N.O.S. 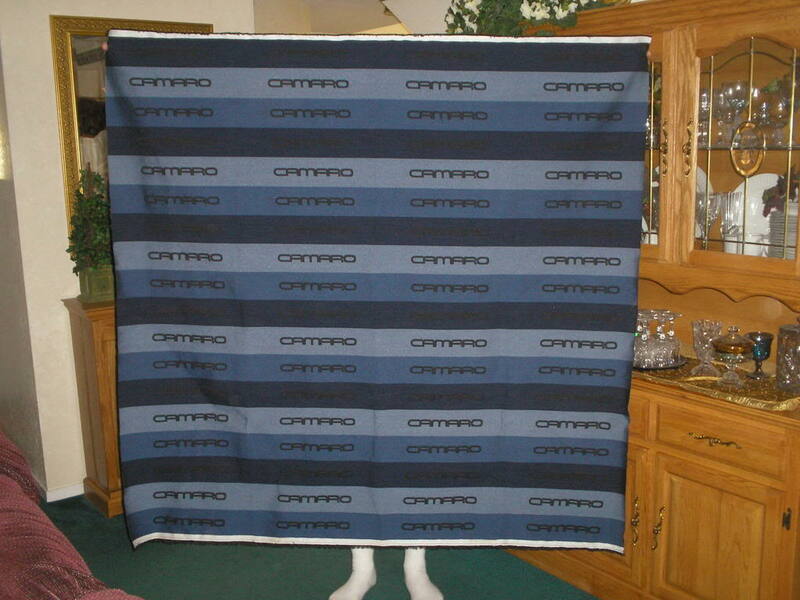 original Camaro striped cloth #3499 in stock available @ $89.00 per a running yard. This is the reply I recieved from Original Auto Interiors. If you really have to have it,bend over. I'll make do with my somewhat faded interior. P.S. Like your interior Subroc. Yup i remember them having a good amount of the stuff. Ill update the original post..now did u ask for black/grey or did you ask for other colors? If you buy some you'll need 42 "Camaro's" to do a complete job, and probably some waste to get the pattern right. Basically 3 columns of camaros. I think there are 18 camaros per column and you need to cut them into sections of 6 starting with the darkest to get the pattern right. I did mine following the factory pattern, just switched up the colors. I still have a patch leftover for the door panels when i get a chance and the money. And yes there is going to be some waste if you want the pattern right. Badman, i really dont think that 90 bucks is that much for fabric that is 24 years old and brand new. Maybe not tomorrow but sometime down the road it will be all gone and anyone interested in these interiors will be kicking themselves that they didnt get it at that price when they could. Its better than the price that the guy on ebay wants for his fabric. 225!! give me a break. Last edited by subroc; 02-23-2009 at 09:39 PM. Thats what I paid!! I had been searching for mine so long that $225 was a bargin. No remorse at all. Subroc, the piece that I'm holding up, is that what you got for $89...? I didnt buy from original auto. I bought from John. I only got 3 rows of camaros and i paid a bit more than 89. I didnt mean that 225 was a bad price for conteur fabric. For the grey/black stuff its steep. For the blue (which i hear is the rarest of all conteur fabric) i dont think you did bad. I bought from John also and was very pleased with the price and fabric. Yea same here. I really got lucky that he had the conteur seats and the fabric that i wanted...and cut me a good price for it all. 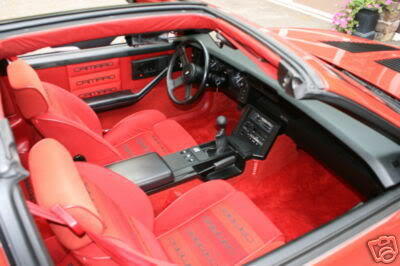 Back in the mid-'80s my uncle had an '83 Trans Am with the L-S interior. I really liked those seats. I was able to find original solid colored fabric to patch the drivers outer bolsters at SMS Auto Fabrics in Oregon. http://www.smsautofabrics.com The fabric ran $85/yd. For the 84 interior, the SMS part number is "84 #447 Red"
Added SMS to the original post. Thanks for posting! There's more info on the seats on their page, but I haven't called for pricing. Thanks for the Info. I edited the original post. 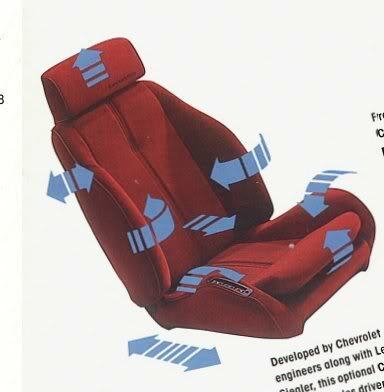 Should also mention, the same L/S Conteur seats came in some the the buicks of the same era. i also need the foam stuff can i get that also? This option for Z28 only includes a special driver's-side seat that features fully adjustable head restraint, thigh and lumbar supports, plus adjustable lateral support for the cushion and backrest. Passenger-side seat is simiarly styled, but without the adjustable features. Available with either standard or Custom Interior. 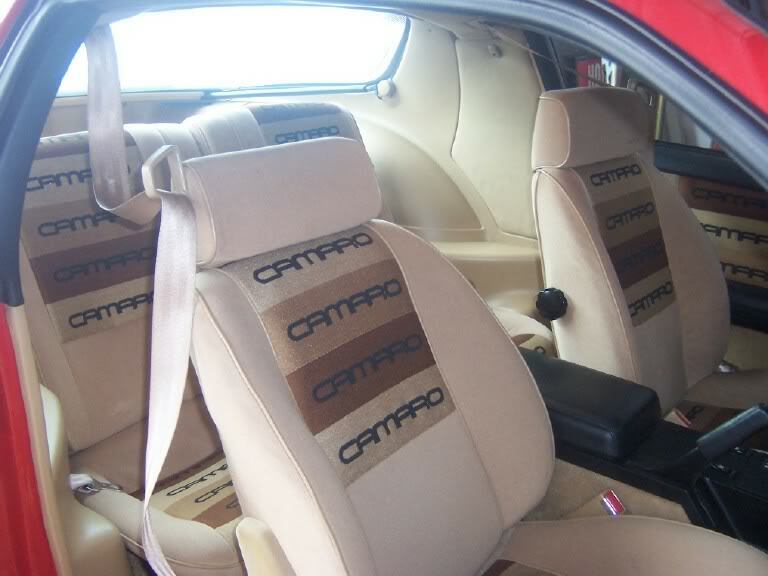 With standard interior: Woven cloth seats and all standard interior features. With Custom Interior: Woven cloth front seats and full velour rear seat, plus all Custom Interior features described above. Four colors are listed for this seat: *Silver Gray, Camel, Maroon and *Charcoal. *Charcoal avaiable only with Custom Interior, Silver Gray available only with standard interior. The revision date on this sheet was 23 Feb 82 with an origianl issue date of 03??80. Somewhere along the line Doeskin became Camel and Dk. Claret became Maroon. I am wondering if GM just changed the names of the colors and not the colors themselves for better public recgonition of the color. Only have a dealer brochure for this one and no examples of different colors. This borchure appears to show 3 of the 4 colors avalable. It is only missing the Maroon/Dk. Claret color. It has a full view of the Camel/Doeskin L/S color on the left side. In the top right picture it has a side view of the Charcoal L/S color. Both of these appear to be the Custom Interior version. 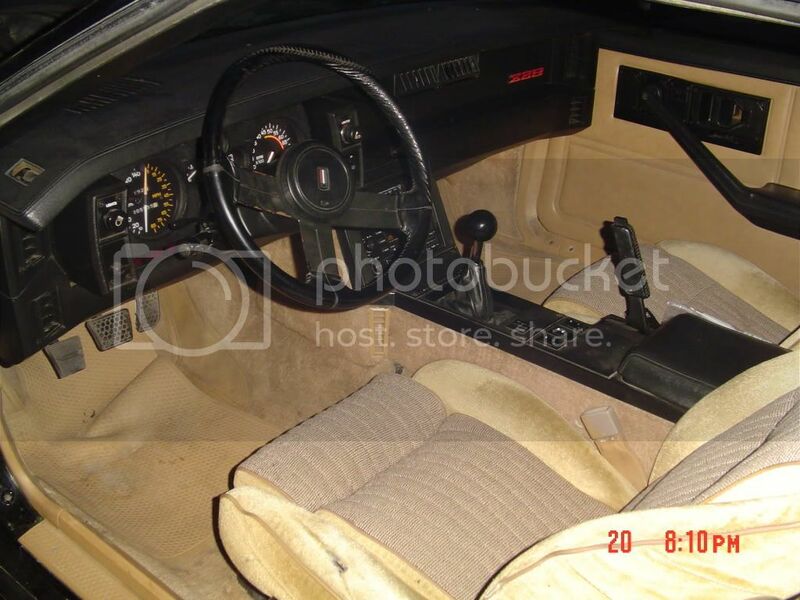 Then if you look very closely in the full size borchure at the photo of the Z28 instrumentation, you can see the same Slate Gray/Charocal L/S seat in what appears to be the standard interior. Note that the insert is sewn different that the photo just above it. I do not the the L/S seats, but I do have the Custom Interior with the Maroon seats in it. I was in the service with a guy that had a new 1985 IROC. Black/with tan interior...fully loaded with TPI,T-tops, custom interior, 5 band EQ and the LS seats (just like the pic earlier in this thread). Those seats were great..really held you to the road. Great car! I wonder if these were usually with the fully loaded models. I've never seen a set with the base camaro or LT.
Yea at the beginning of this writeup i made mention of that. From 82-85 it was only availible on z-28s or higher (iroc). In 86 it was supposed to be the same but there is evidence by John in RI that this is not the case. He got his full power LS from a sport coupe.